Joint pains are, unfortunately, a reality for many of us, and our ability to move around, live healthy and do the things we love is very much impaired. Products such as Doctor’s Best Science Based Nutrition Hyal-Joint are intended for helping your joints become more flexible, so you can enjoy life as before. Based on hyaluronic acid and a proprietary blend obtained mainly from rooster comb cartilage, this health supplement is designed to diminish the aches you experience in your joints on a regular basis, and to improve the synovial fluid, that maintains your joints well lubricated for flexibility. Let’s see what this product is all about and whether it is worth spending money on or not. The presence of hyaluronic acid in the formula is a guarantee for the quality of the product. However, we would have loved to see more ingredients well known for promoting joint health. From this perspective, the effects of Doctor’s Best Science Based Nutrition Hyal-Joint may be limited, although still beneficial for your joints. According to the label, you will need to take two capsules two times every day for one or more months, then one capsule two times daily for one or more months, after which you must take just one daily for maintenance purposes. One bottle contains 120 capsules and it is priced at 26.99USD, so it is on the cheaper side. There is no clear guarantee offered on the official website, and the product is sold through retailers, so you may have to talk about refunds with them. You can contact the company using the website, in case you have issues and questions. Doctor’s Best Science Based Nutrition Hyal-Joint is based on a proprietary formula, so besides the fact that your joints will be supplied with a certain amount of hyaluronic acid and collagen daily, to help your joints, other details are not provided. We cannot help but notice that important ingredients, like glucosamine sulfate, are not present in this formula. 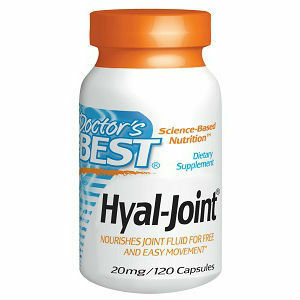 While it may be a good product, Doctor’s Best Science Based Nutrition Hyal-Joint has only limited effects. Mark Stevens	reviewed Doctor’s Best	on December 13th	 and gave it a rating of 2.